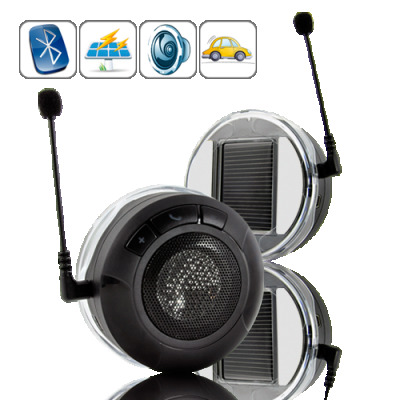 Successfully Added Solar Powered Car Bluetooth Kit with Loudspeaker and Microphone to your Shopping Cart. Enjoy hands-free Bluetooth communication in your car with this Solar Powered Car Bluetooth Kit. No messy wire or cables and no need to recharge, just stick this device to the inside of your windshield and pair it to your mobile phone. You now have the safest and most convenient way to talk and answer calls while driving. There's nothing to it. Now whenever you receive a call, this Solar Powered Car Bluetooth Kit will automatically announce the caller’s phone number (or name if supported by phone) and you can choose to accept or reject the call with the simple tap of a button. If your phone has voice recognition you can even make calls by simply saying the contact's name! And since this device comes with a high quality noise and echo suppression DSP microphone you can enjoy clear and effective communication without interference or distraction. Best of all, this Bluetooth car kit features a powerful built-in loudspeaker that provides you with a clean yet powerful and well-rounded sound. This is perfect for not only making and receiving calls but also for playing your favorite high quality MP3 files directly from your cellphone or MP3 player (via Bluetooth)! The device can also be detached from the mounting bracket by twisting it clockwise, giving you the freedom to enjoy high quality music and hands free calling no matter where you go! If you are looking for an extremely easy to use and hassle-free Bluetooth kit that does exactly what you need it to, then this is the perfect device for you. Try this device today at our highly discounted direct-from-the-factory OEM price and start enjoying high quality hands-free communication within a few short days. This solar powered Bluetooth car kit with loudspeaker is available now for single piece or discounted bulk orders and ships directly from our warehouse within 24 hours. And don’t forget, all Chinavasion products include our full 12 month warranty. Solar powered, no need to recharging and no messy power cables! No batteries required thanks to eco friendly solar charger! Can I load MP3s onto this device? No. This device does not play MP3s it simply streams them from an external audio source via Bluetooth.